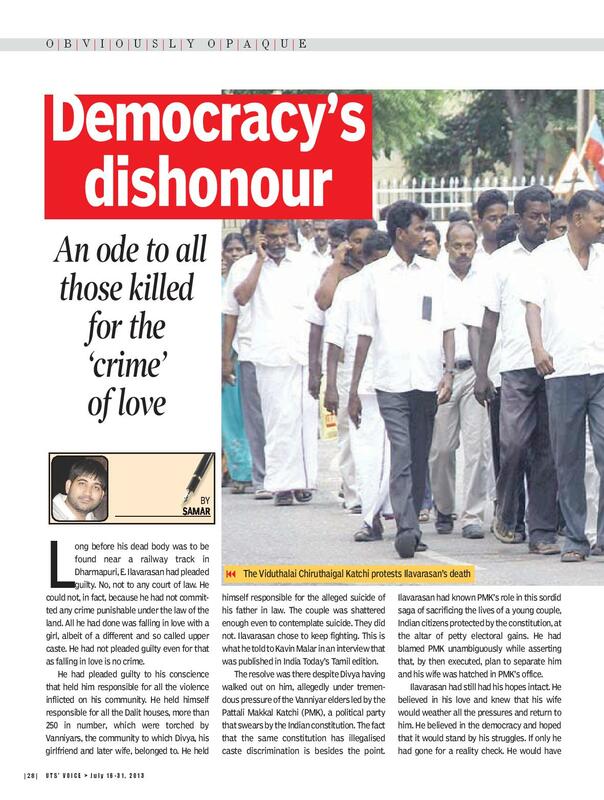 Democracy’s Dishonour: An ode to all those killed for the ‘crime’ of love. Long before his dead body was to be found near a railway track in Dharmapuri, E. Ilavarasan had pleaded guilty. No, not to any court of law. He could not, in fact, because he had not committed any crime punishable under the law of the land. All he had done was falling in love with a girl, albeit of a different and so called upper caste. He had not pleaded guilty even for that as falling in love is no crime. He had pleaded guilty to his conscience that held him responsible for all the violence inflicted on his community. He held himself responsible for all the Dalit houses, more than 250 in number, which were torched by Vanniyars, the community to which Divya, his girlfriend and later wife, belonged to. He held himself responsible for the alleged suicide of his father in law. The couple was shattered enough even to contemplate suicide. They did not. Ilavarasan chose to keep fighting. This is what he told to Kavin Malar in an interview that was published in India Today’s Tamil edition. The resolve was there despite Divya having walked out on him, allegedly under tremendous pressure of the Vanniyar elders led by the Pattali Makkal Katchi (PMK), a political party that swears by the Indian constitution. The fact that the same constitution has illegalized caste discrimination is besides the point. 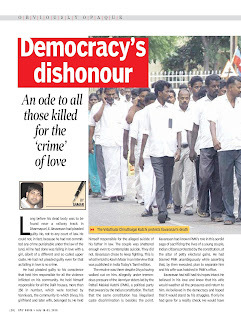 Ilavarasan had known PMK’s role in this sordid saga of sacrificing the lives of a young couple, Indian citizens protected by the constitution, at the altar of petty electoral gains. He had blamed PMK unambiguously while asserting that, by then executed, plan to separate him and his wife was hatched in PMK’s office. Ilavarasan had still had his hopes intact. He believed in his love and knew that his wife would weather all the pressures and return to him. He believed in the democracy and hoped that it would stand by his struggles. If only he had gone for a reality check. He would have known, then, that his was not the first case of individuals pawned by the vested casteist and communal interests deeply entrenched in the system. He would have known how such interests tweak the system for their petty power games. He would, then, have known that one day his body could be found beside a rail track like that of Rizwanur Rahman of Kolkata. He would have known, then, that like him the only crime of Rizwanur was of daring to love a girl of his own choice and marrying her. He would have known, then, that with waning interest of the media and the civil society, his case would be soon forgotten as that of Rizwanur. Rizwanur Rahman, for the uninitiated and/or forgetful, was a bright middle class Muslim professional who had fallen in love with Priyanka Todi, daughter of industrialist Ashok Todi who owns Lux Cozy group of companies worth more than 400 Crores. Fearful of the influential family of Priyanka, the couple got married secretly under the Special Marriage Act. Hardly did they know that it was the beginning of the end not merely of their relationship but even of the life of Rizwanur. Todi family together with senior police officers left no stones unturned to harass Rizwanur and his family. Senior police officers, allegedly including the Police Commissioner, would summon the couple to the police headquarters and threaten Rizwanur with dire consequences in case he did not separate with his legally wedded wife. Rizwanur would be threatened of getting arrested under fabricated charges like stealing a phone from Todi Mansions. Had Ilavarasan known Rizwanur, he would have a fair idea of what would happen after him sending Divya back to her family for a few days. The only difference between the cases is that while in his own case it was a political party named PMK that was coercing him, poor Rizwanur was harranued by nothing less than the police that are duty bound to protect law and order. Had he known Rizwanur, he would also have had a fair idea of the fate awaiting him. He would have known that his wife, like Priyanka, would not be able to survive emotional torture unleashed on her and would be compelled into disowning her marriage and love for him. Make no mistakes here. It is neither Divyas nor Priyankas who are at fault. However much one would want to blame them for ditching their husbands and ‘driving’ them into committing suicide, they are equal, or in fact worse, victims. It is not easy for a young girl to live with the threats ranging from parents and relatives committing suicide to harming her husband/lover, is it? More so with the stigma of compromising their families’ honour by falling for and marrying lesser mortals. Forget Rizwanur, Ilavarasan would have had found his faith in the system entirely misplaced had he known about the infamous dishonour killing of Manoj Banwala and Babli in June 2007 despite Court having given them protection and a five member strong police team first accompanying and later deserting them to be hacked to death. If only he had known that this was not the first, or the last, murder of someone having protection ordered by courts. Similar was the fate of Raja Ram who was allegedly killed by the relatives of his wife Manjit Kaur despite protection ordered by the Punjab and Haryana High Court. If only Ilavarasan had known that he is living in a self-designated democracy that had gone delinquent. If only he knew that it is not merely small political flies like PMK that could run away with launching hate campaigns and term a Dalit boy falling in love with a so called upper caste girl as a part of grand conspiracy to ‘insult’ and humiliate the concerned community. He should had known that he and his people have been long abandoned even by those swear on social justice and are self-appointed champions of Dalit-OBC-Minority cause. He should had paid heed to the fact that identity politics based on caste consolidations had veered from the path of emancipation of all and had entered the murky waters of petty caste interests. He should had paid heed to the fact that be it in Haryana, Western Uttar Pradesh or Tamil Nadu not a single self-appointed custodian of social justice has opened his/her mouth against dishonour killings of victims belonging to Dalit community. Ilavarasan should have kept his eyes open to Haryana politicians of all ilk rallying behind illegal and extra-constitutional Khap Panchayats that seem to derive sadistic pleasure out of murdering love birds. Forget, again, those derided by elitists and upper caste middle classes as casteist politicians, he should had seen a certain suave and urbane Naveen Jindal of Indian National Congress praising Khap Panchayats for their ‘yeoman services’ to the society. He would have known, then, that the democracy he believed in is in essence a farce superimposed on a society divided by a thousand pre modern fault lines of caste and kinship. He would have known that people like him are mere expendables for the system. He would have known, then, that his murderers would soon be referred to as honourable Member of Parliament or Legislative Assembly and the same police which looked the other way when Dalit hamlets were being torched would bend backwards to open the doors of their red beacon cars. Had he known all this, he would not have turned into a dead body found near a railway track in Dharmapuri. Had Rizwanur known all this, he would not have turned into another dead body found near rail tracks some 3000 kms away from Dharmapuri. But then, his sentence was decided the day he had pleaded guilty of falling in love with a girl belonging to a different, and so called upper, caste.